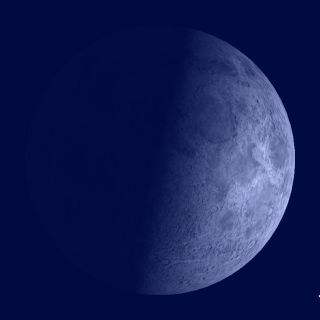 Tonight (June 8, 2011) the first quarter moon dominates the evening sky. Tonight and the next few nights are the best nights this month to watch the changing play of shadows on the face of the moon. Tonight (June 8) the moon reaches the first quarter mark on its 29.5-day trip around the Earth. That's why we call this phase of the moon "first quarter," the first of four quarter marks: first quarter, full moon, third quarter (or last quarter), and new moon. At this time, 10:11 p.m. EDT (7:11 p.m. PDT) tonight to be precise, the moon is perfectly side-lit by the sun, making it an ideal time for observation by small telescopes. This is because the long shadows cast obliquely by the rising sun along its terminator (the line between light and dark, sunlight and shadow). The moon skywatching illustration here shows how the moon will appear in telescopes to skywatchers with clear weather and dark skies tonight. Look closely at the ball, and you will see detail along the line between light and dark, brought out by the sun’s glancing rays. Similarly the detail along the lunar terminator is cast into high relief. Try looking at the moon with binoculars or a small telescope. Immediately you will see a large amount of detail. The moon as seen through 10x50 strength binoculars rivals the views we get of the planets with the largest telescopes. The first thing you notice about the moon in binoculars is that its surface is not all the same color, but a mixture of dark and light areas. The north half (top in the northern hemisphere) of the moon is mostly dark in colour, the south half (bottom), mostly white. The north half of the moon is mostly wide flat open plains, called "maria" (singular "mare") by early astronomers, who thought that they were seas. Today we know that they are flat dry barren plains, the results of old lava flows. The southern half is higher in altitude, more mountainous and pocked with the moon’s characteristic craters. With a telescope, you will see that the older crater formations have become riddled with newer smaller craters. Early in the solar system's history, there were many large asteroids orbiting the sun, so the old impacts are large, sometimes hundreds of kilometres in diameter. With time, the large asteroids were mostly swept from the solar system, so that the bodies that impacted the moon in recent times are all smaller in size. This layering of crater sizes lets us deduce the history of crater formation on the moon. When observing the moon, concentrate on the terminator, where the shadows are longest and the relief boldly highlighted. Look for craters with different formations inside them and, in particular, look for the smaller recent craters which pockmark the older larger craters. Concentrate on a singleformation just beyond the sunlit portion. Spend an hour or two at the eyepiece watching this area as the sun rises over it, and the dark crater floor gradually fills with light. Often there is a dramatic moment when the sun breaks through a gap in the crater rim, and a beam of sunlight floods the floor of the crater. The moon has no atmosphere, so hence no rain or weathering, except for the constant fall of tiny meteors. What we see tonight has changed hardly at all during all of human history. In fact, the basic features of the moon were established before any form of life emerged on Earth. When we look at the moon with our telescopes, we are truly looking back billions of years in time.